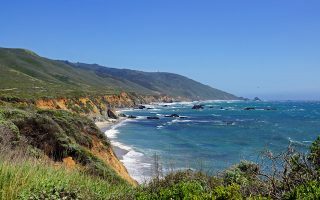 Big Sur is widely celebrated as one of the most scenic locations in the United States, the jewel of California’s central coast just off Highway 1, where the Pacific Ocean meets the Santa Lucia mountains. 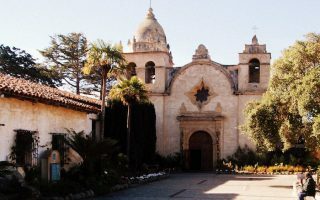 While Big Sur itself falls just south of the Monterey Bay, we’ve also included the towns of Monterey and Carmel-by-the-Sea in our guide, so you can enjoy the region to its full running potential. 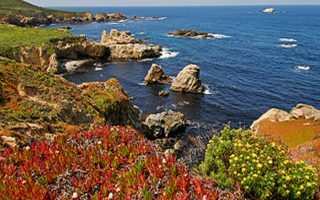 Our guide to running in Big Sur, Monterey, and Carmel includes gorgeous coastal trails, scenic roads, beaches, and redwood forests. 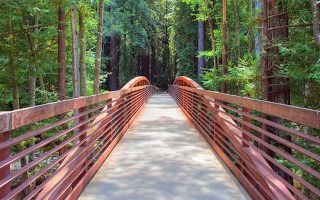 The redwood forests here, which Jack Kerouac and other literary giants wrote so sentimentally about, host a wealth of routes for trail runners, but we’ve diversified our guide to include roads, recreation paths, and beach runs (as well as a couple of the most noteworthy trails). Most are located just off of Highway 1, which is a nice scenic drive but does not have a safe shoulder for running. From downtown Monterey, the Coastal Recreation Trail is a nice commute around the coast while Jacks Peak will take your run to new heights. 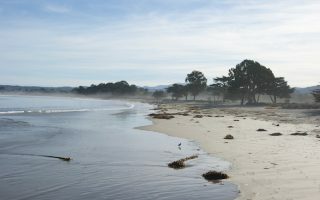 The Monterey municipal and Asilomar beaches have prime sand running. 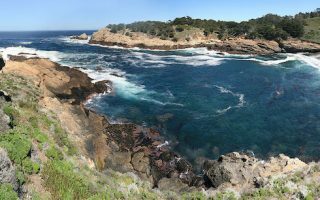 Carmel has its own share of scenic runs in the Scenic Road and Point Lobos routes. And in the heart of Big Sur, the views don’t get any better than on the Old Coast Road. 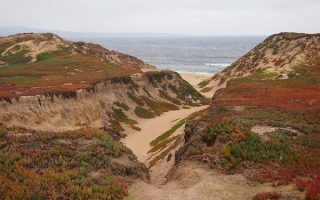 A car is nice for exploring Big Sur to it’s full potential, but the Monterey-Salinas Transit bus does make stops between Monterey, Carmel, and Nepenthe in Big Sur several times a day. For routes closer to Monterey, there is a free trolley which makes key stops in downtown, Fisherman’s Wharf, Cannery Row, and Aquarium of the Bay. NOTE: Landslides and wildfire have impacted Big Sur road and trail conditions in recent years. 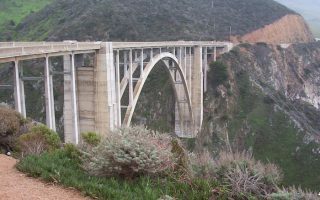 As of Spring 2019, large sections of Andrew Molera State Park, Julia Pfeiffer Burns State Park, and Pfeiffer Big Sur State Park were closed for renovations. Be sure to check road conditions and park information before making travel plans. ALSO: Running on Rt.1/Pacific Coast Highway is not advised. Many sections don’t have a good shoulder. The highest point along the Monterey Peninsula, Jacks Peak is the go-to trail run for locals who want to skip the busier tracks along the coast and still get in some killer views. 500 acres, 8 miles of trails. Hilly but not too technical. Fantastic running options in this coastal city located 30 miles south of San Jose. 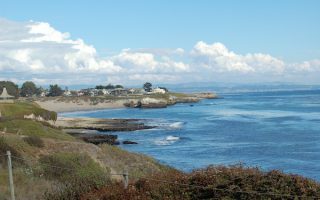 Cliffside running trails, redwood forests, the gorgeous campus of UC Santa Cruz, a riverside path, and great beach running. Could runners ask for more? The weather in this area is hugely influenced by the coast. The cool ocean waters keep temperatures more uniform. It rarely gets hot, or cold. Average high temperatures are between 60F and 70F (16C-21C) year-round, about 10F higher in summer than winter. Nights are cool — you’ll need a layer — with lows in the 40s in winter and 50s in summer. 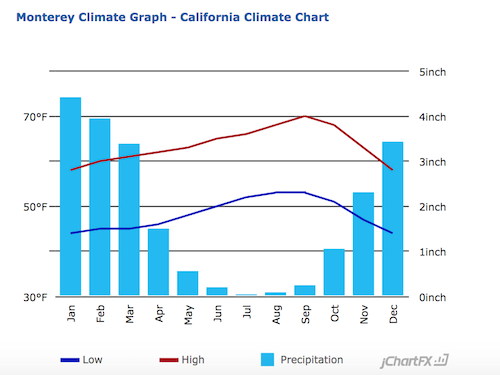 Most of the 21 inches of annual rain falls November to March. Note that wind and fog can be a factor. There can be days of overcast, where one seems to be waiting for the sun to burn through. This is mainly a tourist area, so there’s a wide variety of accommodations. 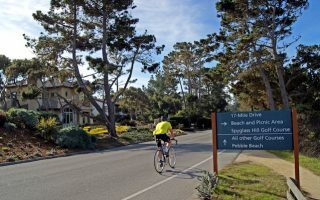 There’s super luxurious accommodations in Monterey and Carmel, and more budget friendly options. In Monterey, for the best proximal running, try to stay near downtown or the coastal trail. 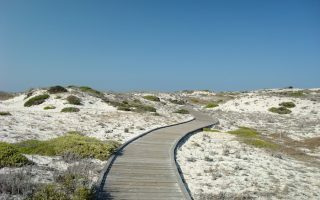 Most of the hotels in Carmel are downtown, and near a few of our favorite running spots. In Big Sur, there are hotels along Rt. 1. 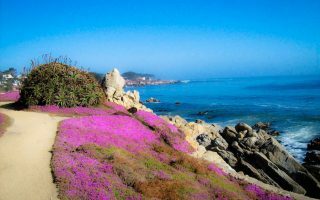 For lodging and other travel information, visit See Monterey, Carmel California, of the Big Sur Chamber of Commerce. The Treadmill in Carmel is a local gem for sports equipment and outdoor fitness knowledge. The Wednesday Night Laundry Runners do their wash and a group run around Monterey weekly. Running Calendar, courtesy of Fleet Feet. The Big Sur Marathon is the area’s biggest event, but the same group hosts races throughout the year.